The HCN-5000, Mazak’s world-class horizontal machining center, is now available with the company’s Multi-Pallet Pool (MPP) System, a basic automation solution in a compact footprint. Thanks to the innovative MPP System, shops that lack the floor space necessary to accommodate a conventional linear horizontal pallet stocker now have the ability to automate for continuous unmanned, lights-out operations. The new automation system features an innovative carousel-style design that maximizes utilization of space – it offers the convenience of a larger Mazak PALLETECH System while taking up to 40 percent less room. Servo motors on each axis, as well as a two-level pallet arrangement that keeps each pallet the same distance from the center of the stocker, ensure fast and stable loading/unloading. Designed to expand as production needs grow, manufacturers can reconfigure the system’s standard 10-pallet stocker to house 16 pallets for even further increased output. With the large, heavy part operations of the HCN-5000 in mind, Mazak made this latest MPP the biggest version in terms of part size yet. The system houses 500-mm-sq. pallets that accommodate workpieces up to 800 mm in diameter and 1,000 mm high. 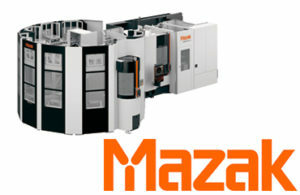 For overall process optimization, Mazak provides its SMOOTH MPP software in the HCN-5000’s MAZATROL SmoothG CNC control. Operators can easily monitor production status with scheduling functions, tool storage monitoring and system utilization analysis accessible from the control’s capacitive multi-touch screen. Options for network access also allow remote monitoring of production. The new automation option makes the HCN-5000 an even more highly flexible machining solution. A wide variety of high-speed or high-torque integral motor/spindle types ensures that shops can match spindle performance to specific materials, including everything from steels to nonferrous metals. Part production also benefits from the machine’s highly rigid spindle, numerous tool magazine options, quick rapid traverse speed and vibration-free acceleration/deceleration, making for the perfect combination of advanced technology and exceptional value.